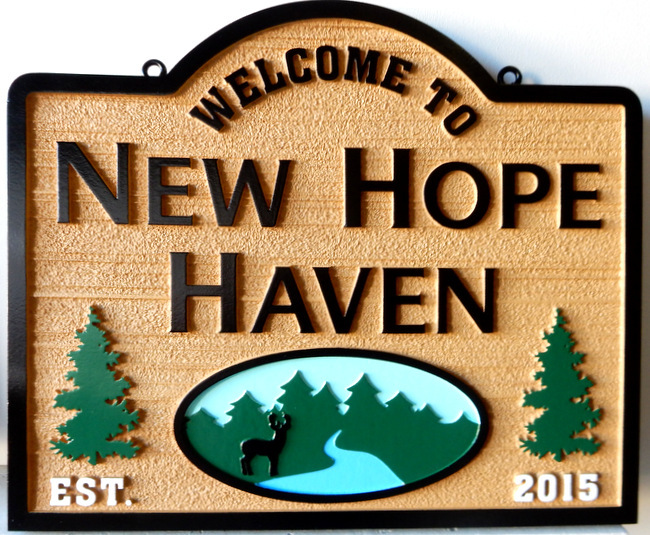 Above is a design of a cabin Welcome sign "New Hope Haven" that features a scene of a lake/river, trees and a deer. Five depths of 2.5-D flat relief are been carved into the HDU material. The outer border, text, and scene are elevated above the sandblasted (wood grain texture) background, . After painting by an artist, the sign is clear-coated twice for additional UV and weather protection. This sign can be mounted on a door, an adjacent wall, a gate, on a metal or wood post, or hung from a wood or iron hanger. We make custom carvedwood and High-Density-Urethane ( HDU) residence, vacation home, and business signs or plaques of any design in any size from 12 inches to 14 feet. We can customize these signs with any shape, border, font style, or color scheme with carved (engraved) or raised text and artwork of your choice. These can be placed on an entrance gate, a monument base, between iron or wood posts, on a outside or inside wall, or on an outside door. They can also be hung from a wrought iron scroll bracket or wood beam which may be supported by steel or wood posts.